Music is that art form that connects souls in a way no other can. Its medium is sound and silence, redefining space and time. The creation, performance, significance and definition vary vastly according to culture and social context. Today we have a boom in electronic music because of the advent of affordable music technology. Music software is the computer software used for musical compositions and digital recording, the creation of electronic music and other applications. Music software has been around for almost half a century since its birth in the 1960s. It has had a significant impact on education involving music and creative expression. Mostly, music software is an outlet for people who do not bond with traditional musical instruments. New innovative ways are being thought of every day to compose and perform music using technologies that have never been seen before. It is one of the most feature packed and creative application the on the list. It is highly up to date and provides a free and powerful suite for both Linux and Window OS. It has features that are primarily seen only in paid or licensed software. The LMMS gives you tools for the job of composing, adding beats, providing bassline editors, a piano roll for melodies, effects and a complete studio with standards. LMMS came compatible with MIDI keyboards and built-in sound synthesizers in a superb package that is free of charge. It has a live recording feature that incorporates a microphone, a mixer or other media. You can import and export different file formats for editing. Allows basic copy, paste, delete and cut operations on audio files. There is a broad range of keyboard shortcuts at your disposal along with a multitude of sound effects and extensible plug-ins. Here is a music producing software that will help you become a professional DJ, available on the cross-platform. You can use it on Mac, Linux and Windows. Mixxx allows you to test your audio after you complete your production by mixing in other audio files while listening to it. You get it in the studio and can go sound producing with it. Some of its features include an advanced four deck controls, built-in sound effects, quad sampler effects and a DJ hardware support. 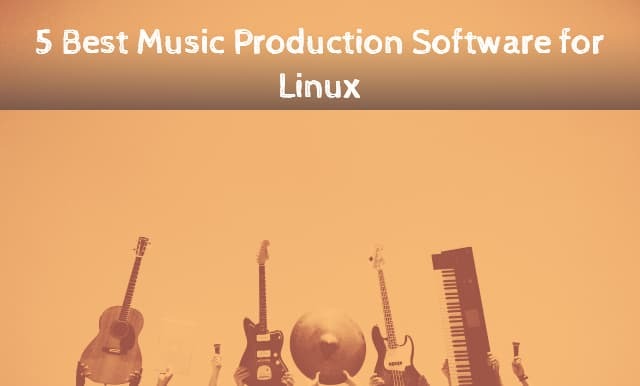 It is a music composing and editing application that is available exclusively on Linux and intended for music composers. Rosegarden is a suite similar to LMMS but is aimed mainly at producing. Rosegarden can be used at home or in small scale recording environments. Those who understand music notations can have a lot of fun with this while making music using a score. It also supports basic digital audio. Rosegarden has some intuitive MIDI management with about a 100 devices that are supported. There is also a capable audio editor and sequencer with multi-language support. This is not essentially a music creation tool but facilitates the creation of music through the use of other software. The purpose of this software is more like a big virtual mixer that allows you to extract the audio of your choice and reroute it to other applications. It is a feature-packed offering. More than a MIDI and audio sequencer, Muse combines recording and editing abilities into one package. Muse keeps things simple and has a multitrack virtual studio that is available only for Linux. There’s a full MIDI import/ export support, editing with piano editing and drum roll, external synth plugins and integration with other programs. A must have for avid producers. It is an audio multitrack sequencer & offers primary interface as AUDIO/MIDI and designed specifically for personal home studios. It runs on Linux as a target operating system with some unique features. It supports different audio formats, has a built-in mixer and monitors controls. There are a loop recorder and MIDI clip editor. Qtractor provides non-destructive and non-linear editing. Available on Linux and Mac, Ardour allows you to record, mix, edit and master audio and MIDI projects. It can be used by anyone related to the music production field – editors, composers, etc. Ardour provides a flexible recording and multichannel tracks. You can import and export audio files to different formats, and the software provides automation! Cecilia is an audio signal processing software. It allows the user to explore music composition and sounds and is primarily intended for sound designers. It runs on Linux, Mac and Windows too. Cecilia allows you to create your custom GUI using a simple syntax. It has some built-in modules that allow the user to add their sound effects and synthesis. Cross platform multitrack recording suite that is known for its unique interface that is tricky to master. Traverso DAW has support for CD mastering and non-linear processing. It covers plenty of tasks that are usually reserved for premium music production software. It is fully customizable to suit your music creation needs, designed for scalability and can be used by live musicians with the help of a netbook.